I thought I would start a thread on a topic that often comes up, but rarely expanded upon. I’m curious what your thoughts and practices on self defense for your own situation. I’ll start by giving you mine. After my military duties I went into guard work while attending college. I was an armed guard. I got into a few scuffles with people on that job. My employer was a former police Captain retired and he insisted we take some self defense courses. Our company also had a K-9 unit and I got to be a decoy a few times. That was fun! After that job I lived my life in relative security with little thought about the state of my personal defense. In the last five years however, things have begun to change around here. First and most important to me is a mind set. I seek to avoid trouble as much as possible through awareness. I do not carry gun for a couple of reasons I won’t delve into now, but it’s a topic I have often considered. Here’s what I choose to carry in certain times and places. The most important one is the flashlight. The other two, the Kimber Pepper blaster II and a Smith and Wesson knife with various attributes. The Pepper Blaster is the second one I owned. The first one I practiced with. It shoots Pepper spray sort of like a pellet pistol shoots pellets. I don’t have a ton of faith in pepper sprays though to be honest. Last edited by Thunktank on Mon Apr 15, 2019 7:52 pm, edited 1 time in total. I've had a couple of events in my life that I was unprepared for, that I didn't think I would escape, but did. Those incidents pop back into my head when I start to get complacent about always having some type of protection. I've actually had to defend myself a few times, the most notable was once with my car and another time with a large screwdriver/pry bar. I pulled a handgun another time and had a positive outcome without firing it. I figure someday the need will come up again and I hope I at least go down trying. I belong to one of the organizations that split off from Taika Seiyu Oyata's RyuTe Renmei after his death. For those to whom that might as well be in Greek, that means I practice classical Okinawan karate with an emphasis on vulnerable point striking and close-quarter seizing, locking, and throwing. This is a montage of seminar clips of Oyata that someone put together as a tribute after his death. I include it in case anyone wants to see what I am talking about. My occasional references to "my teacher" are to the man who was my principal teacher in this art. We have cane techniques in our system. The cane is wonderful. You can carry it anywhere and nobody bats an eye. I have not yet felt the need to carry a gun. Being aware, avoidance, and diffusing aggressive confrontations are all good and I think preferable. In the police academy I studied take downs and holds, and of course perforating threats. Gang violence has gotten rather bad here of late and it is no longer limited to fights among gangs. I absolutely agree with Hov that awareness, avoidance, and the ability to diffuse are the first line of defense. Unfortunately, there are times that those aren't enough and it's a good idea to have some additional options. When I was in high school, our youth pastor said that he refused to learn any sort of self-defense techniques because then they would be in his "pool of possibilities," meaning that it was something he would possibly use against somebody. If it wasn't in the pool of possibilities, then he never had to worry about using it. As an idiot sixteen year-old, it sounded wise to me. I have since learned that it was an extremely foolish approach. If there's nothing else in your pool of possibilities, then your only options are 1) lose - probably catastrophically, 2) try to run and hide - which may not be a real option in your circumstances, 3) flail at your attacker, probably ineffectually, or 4) go flying-mouse-feces crazy. Those are not good ways to keep yourself safe. They're even worse ways to keep your loved-ones safe. I didn't realize at the time, and obviously neither did he, that by increasing your pool of possibilities, you a) can choose an appropriate response and b) have the confidence that you can handle yourself so you don't need to needlessly escalate. Avoidance and awareness, yes. Good points. Also, staying in good shape, being flexible, and having some endurance, in my mind, is helpful when it comes time to defend yourself. Run, Hide, Fight is what is being taught in schools and colleges now days in case of an active shooter situation. It's shame things have gotten to that. As other posters have said, situational awareness is key to avoiding many situations when you're out in public. Next time you see a cop walking around watch them for a while and you'll see them constantly looking around and behind and scanning the area for threats. They call it "head on a swivel". Cell phones can be deadly. Keep any eye out for things that can be used for defense in a worst case scenario if you aren't carrying a personal defense weapon: a bottle, a brick, a stick, a fire extinguisher, keep an eye out for those things where ever you go. In a restaurant or store, check for escape routes, back doors, and exits, etc. That kind of mindset takes practice but it can save your life and the lives of people who are with you. 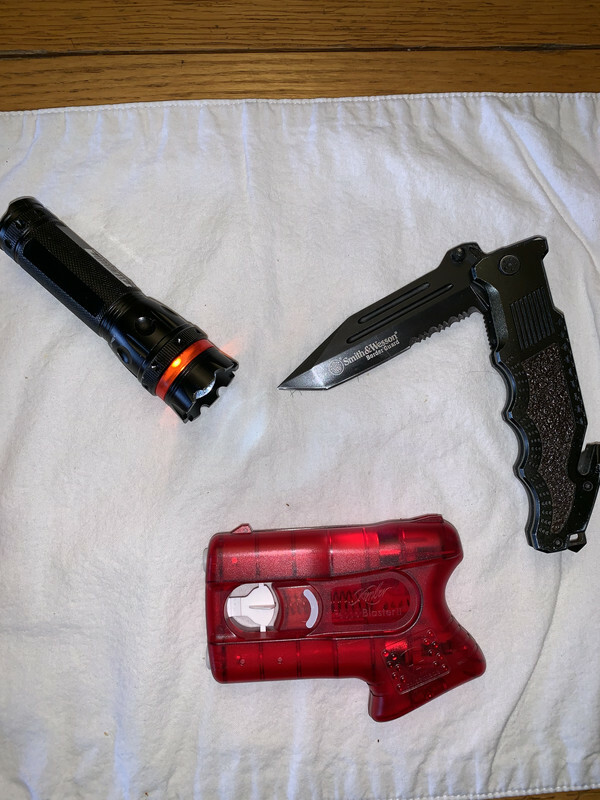 Some people may not want to carry personal weapons, even things like folding knife, cane or a heavy flashlight when walking the dog at night but it's better to have it and not need it than vice versa. But that's a personal choice for each person. After I fully retired I didn't carry a firearm very often. A buddy of mine asked me why and I had no good reason. I was going through a tough time and said that I almost (ALMOST) would rather get shot than to go through all the turmoil, investigations, lawsuits and media attention if I ever did have to shoot somebody in self defense. He put it all in perspective when he said "How about your family? What if you had to defend them?" Now I carry all the time everywhere that it is legal. Again, better to have it and not need it than vice versa. I'm on my church security team and carry during the service. But carrying a firearm is a HUGE responsibility and requires a high level of proficiency that can only be gained through constant practice. Many people get a Concealed Carry Permit, buy a gun and rarely if ever practice with it. That is a disaster waiting to happen. I call it the IGL (I'll Get Lucky") School of firearms training. It is dangerous for the person carrying and for any bystanders in the event he/she has to use the gun. If you do choose to carry a firearm it is vital that you practice with it regularly and not just target shooting. You should pay a professional to train you in simulated combat situations, moving, scanning, shooting, reloading, taking cover, etc. It's not as simple as just buying a gun and a concealment holster and carrying it. Also, many people buy a very small handgun because it is lighter and easier to conceal. I disagree with that. There are many mid sized firearms that conceal just as well as the tiny guns, and they are more accurate and the magazines hold more rounds and the calibers are much more efficient than the little .380's and .25's. Just my opinion. I do mentally prepare myself for a fight. I have had some training as well, long ago. Regardless, I will go out of my way to avoid one. I frequently read the crime reports in my area, the places I frequent. I do this to know what sort of real threats are most likely to happen against me. Not long ago, there was little more than petty theft. Today, shootings rarely happen except between criminals and transients themselves. There was one armed robbery of a store lately. However, assault and battery and even kidnapping are starting to happen against innocent citizens by desperate thugs far more than they were happening. They are using knives, brute strength and blunt force objects to intimidate. I have the sweetest elderly couple neighbors who took their dog for a walk around the neighborhood one night when some young punk crossed the street just to punch the old man for no apparent reason at all. He walked around with a bruise on his head for weeks. Coyotes, the four legged variety and bad tempered dogs are always a threat. I had one coyote sneak up behind me while walking my dogs just last week, within 15 feet of me. When I turned around I shined my flashlight into its eyes and ordered it to go away. It didn’t run away, it SLOWLY walked away. No fear. I believe wild animals ought to fear us, especially predatory animals. I aimed the beam of light and my pepper blaster straight at it’s face until it changed direction. Knife fighting isn't something I'd want to contemplate. In CA we're pretty much restricted to folders, and no matter how fast one is, that fact adds another layer of complication to putting up a defense. A gnarly looking tactical folder can look intimidating but how up on knife fighting are we, really? An accomplished knife fighter is something to behold, but who trains regularly? Maybe some LEOs and martial artist types, but probably not. In a knife against knife fight everyone is likely going to bleed, and bleed bad. At least that's how it seems to go down in my town. While a knife is arguably better in a desperate situation than, say, fists, any blade has to be considered a deadly weapon. My preference would be for escrima sticks (or cane) or a pistol, which allow a wee bit more distance. The older I get the more informed I am of my own physical limitations. A firearm is the great equalizer. Most of the time an attacker doesn't expect a citizen to be armed and will abandon the attack when a firearm is drawn. The happens a lot. OTOH they'll sometimes escalate the attack, which means you're dealing with some ape s*** crazy dude and you should be even more fearful, if that's even possible. Good CCW insurance is cheap. Most days I carry a Glock 27 (40-caliber subcompact 9+1). Other days I have a Ruger LCR .38+p (5-shot J-frame revolver) in a pocket. I carry more days than not over the last 10 years. Never had to draw, and I pray I never do. My folder had a “window breaker” and is rather substantial. Even if not open, it’s dangerous. Knife attacks scare the hell out of me. More than guns actually. This is because knives are rarely used to merely intimidate a victim, but to kill them. The attacks are close and quick. Most of the time the attacker goes in empty handed first to control the victim, then stab them multiple times. The victim probably won’t be able to draw a blade on a folding knife. Other means of self defense will need to be used, which is why my knife’s size and window breaker feature is there. If I’m lucky between stabs or am able to gain some distance, break a hold or whatever. I might be able to fight back with something. I think a big stick is probably the weapon against knives. But basic evasive training is best of all with a snub nose revolver. If those fail, incapacitate and move along. I carry multiple options on myself to incapacitate. I will add: Train. Train. Train. Live left of bang. I agree with you, awareness is important. For example staring at a cell phone in a public place is really dangerous. I've seen a surveillance video of a drunk college kid staggering through an empty parking lot late at night with his eyes glued to his cell phone. A group of six assailants walked up behind him, spread out like a pack of wolves and then attacked him. It's called "swarming". One of the group had a gun. They beat and robbed him with the gun stuck in his face. That kid never had a chance because he was oblivious to everything but that cell phone until that first punch to his head. The good news is that it was a police surveillance video and the dispatcher had been watching it all unfold. Within 30 seconds three bike officers came sliding up and apprehended the assailants at gunpoint. The bad news is that the oldest was 17 and the one with the gun was 15 which in NC meant that he could not be tried as an adult and his record would be expunged when he turned 16. Even the ones over 16 were considered "Youthful Offenders". None of them got any active time. Here’s a thought provoking interview about using knives in self defense. Considering the legal considerations and how the human mind works. It also dispels the myths of knife dueling. You know, the ones that teach us how everyone gets cut up in a knife fight? Yeah, this guy gives solid advise on how to use a knife defensively to avoid so much of that. I must admit, that I have been rethinking my position about obtaining my CCW and getting a gun. If I’m already carrying a knife as a defensive tool. Why shouldn’t a gun be considered where allowed? Where one is legal and ethical to use, so is the other, right? I am fortunate to live in an urban county in California that has had pro-self defense sheriffs that liberally issue CCWs. Maybe I ought to take advantage of that. Had my situation changed enough to justify the time, planning and effort to carry a firearm? I will contemplate. If possible, Mr. Tank, I'd suggest getting a permit now, if it possible, whether or not you're ready to use it at the moment. That way, if your mind changes, you're instantly ready. I originally got mine not to carry, but in case I accidentally did something wrong on the way to or coming back from the range. Basically so I wouldn't fall afoul of Pennsylvania law. But when I got my first death threat, it was nice to be able to immediately carry, not wait the approximately two weeks it would have taken at the time.